...beating down on the city streets. I greatly dislike hot weather, and when people say "What a glorious day!" I can only answer "Mmmm. It's hot" or talk about something else as in " Mmmm. I'm just on my way to..." whatever. The grass turns white and grey. Rooms get stuffy and open windows admit traffic noise and dust rather than cool air. Trains become like ovens. Everyday tasks become less pleasant, but of course still remain to be done. Walking becomes less enjoyable. Small treats like a decision to choose a pleasant route become less possible: the priority has to be on not arriving looking hot and sticky. Heavy luggage becomes a real burden instead of a bearable nuisance. The rule is to pretend that none of this matters, so I bought some new sandals and walked with a spring in my step. The sandals broke. I've now got another pair. Apart from writing this blog, I am not allowing myself to whinge about the heat and am pretending that it's all hugely delightful. I've got a delicious cool drink and the roses outside the window are lovely if rather tired. The washing has dried quickly on the line. It's nice chatting to neighbours as people are out and about instead of shut indoors. Lots of people all over the world live with searingly hot weather all the time. A bonus was the glorious sung Mass this morning. There is a really excellent choir, with young singers from across Devon. Afterwards I met several over coffee and snacks in the South Gate lodge, while the Abbey bells poured glorious peals out across the countryside. We were staying at NorthGate...the the Abbey has a good deal of property and attrracts great numbers of visitors, and the accomodation and meals were extremely good. As we sat at lectures in the modern Conference Centre, tourists arrived to enjoy the Abbey grounds, children scampering across the lawns, and people pottering around the various gardens. Compline in the Abbey church, and dusk falling as we make our way back across the lawn to our guest house. Ghastly news from America and a sudden sense of sadness: a great nation failing and falling. ...has been the subject of an excellent exhibition in Westminster Cathedral for the past few weeks, organised by the diocesan archivist Fr Nicholas Schofield. The exhibition is now touring some other churches in the diocese. Manning's brilliance shone at Oxford and people spoke of him as a future Prime Minister: instead he took Orders in the Church of England and dedicated his life to the message of the Gospel with great seriousness. The early death of his young wife increased that seriousness, and when he became a Catholic it was with a deep sense of solmen commitment which is revealed in all the subsequent photographs. As an old man he looks gaunt, and there seem to be no pictures of him smiling...but he was not a grim figure and his trach record of service to the London poor, of establishing schools (over 40 of them), of public duty (a leading figure in the campagn to build decent homes to replace hideous slums) is extraordinary. I went to Westminster catheral to meet Fr Nicholas and helped to take down the exhibition and pack it away for its next destination. The Cathedral looks particularly impressive at the moment, because this coming weekend marks the feast of St John Southworth, the heroic London priest whose body lies in the Chapel of St George and the English Martyrs. Each year it is brought out to the central aisle and surrounded by candles, and people come to venerate it and to pray. He ministered to the dying poor in the years of the London plague in the 17th century - but it was illegal to be a Catholic priest at that time, and he was arrested and executed. ...off to Buckfast Abbey for a weekend of lectures for a catechist course. On to dinner in Marylebone to discuss various plans for future Catholic activities. Midsummer in London. ...takes place each year on the Sunday nearest the feast of SS John Fisher and Thomas More. We start in the churchyard of St Sepulchre-without-Newgate, and walk the route along which Catholic martyrs were dragged in the 16th and 17th centuries to brutal death at Tyburn. We stop at St Etheldreda's, Ely Place, SS Anselm and Cecilia in Holborn, St Giles-in-the-Fields, (CofE, goodwill visit) and St Patrick's Soho. We pray the Rosary and other prayers, and at each church we have a short history-talk. This year we had a large crowd - but we were well-prepared with microphone and leaflets etc and it all worked well. Home after a happy final evening in Munich, beer in an open-air market with all the team, and then hopping to a pleasant restaurant for a cheery meal, talk and laughter. And then today, a change of pace...Sunday in London, Mass at Westminster Cathedral, and on to the annual Martyrs' Walk, which starts near the Old Bailey and finishes at Tyburn with Benediction, and a splendid Tea produced by the good Tyburn sisters. The Bavarian tourist industry, which is thriving, offers beers, sausages, local costumes etc in great abundance. Apparenly when BXVI was first elected there was "Benedict beer" and shops sold BXVI teddy bears and cakes and so on, but there's nothing of that now. However, every church and village and institution with which he has ever been associated marks him with plaques, statues etc. ...meet at St Sepulchre's churchyard, near the Old Bailey at 1.30pm for a 2pm start ...it's the annual Martyrs' Walk through London. We'll be stopping at the Church of SS Anselm and Cecilia,, at St Giles-in-the-Fields and at St Patrick's, Soho. - where they are holding their annual Bazaar in the Garden Square, in aid of their work for the homeless - and will then go on to Tyburn. At Tyburn we have Benediction, and then the sisters give us a splendid Tea. ...in Uxbridge, with parish priest Fr Nicholas Schofield, some lovely Brigettine sisters from Iver Heath, and a wonderful team of friendly parishioners! 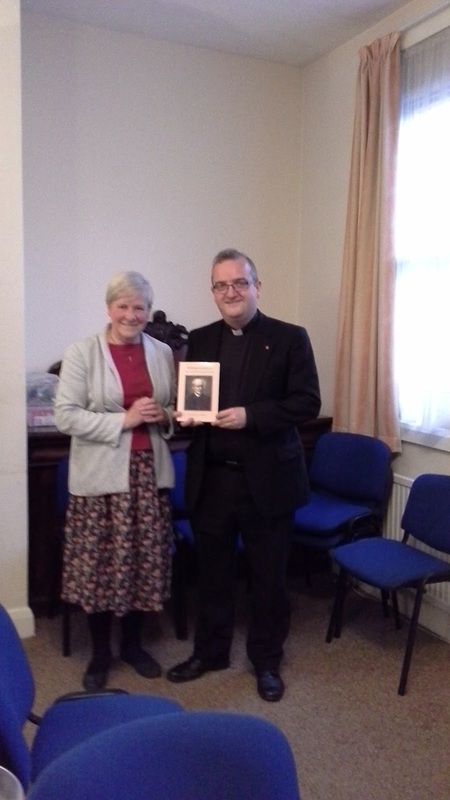 ...the Ladies Ordinariate Group, the speaker was Fr Nicholas Schofield, who told us about Fr William Lockhart, friend of Bl John Henry Newman, and a remarkable London priest whose generosity and efforts brought back the ancient church of St Etheldreda's, Ely Place, into full use in the Catholic Church. Fr Nicholas' book on Fr Lockhart, which he's holding in this pic, is a good read, and brings alive the events and activities of the Catholic Church in mid-Victorian London. St Etheldreda's is a popular church, which served for many years as the Guild Church of The Keys, the Catholic Writers' Guild...a plaque in the crypt commemorates this. On Friday, I am speaking at Fr Nicholas' parish in Uxbridge, on "Celebrating Feasts and Seasons". All welcome - come and join in! ...and this is central to our dignity as human beings. And Papa Francis has just emphasised this again...and we must teach this truth, and challenge the ghastly gender ideology which campaigners are trying to impose on us. ...when the Church gives its definitive statement on the alleged visions at Medugorge. Like so many other Catholic writers, I've met numbers of good people who have had profound experiences of spiritual renewal at Medugorge. And I've been told dozens of times that I "ought to go" and so on, and so on... But I've never had any desire to go there, and have always assumed that the Church would eventually say something along the lines of "This is a place where many good people have prayed and found help, where many good confessions have been heard and much good has been done...but we cannot state that the alleged visions are authentic." The sheer volume and vagueness of the "messages" together with the seemingly unending saga of the thing as it has expanded over decades made it seem unlikely that there were actual, literal, visions of Our Lady involved. When the decision is announced, it will be horrible to see and hear the gloating of people who have long sneered at "mega-forgery" and who will delight in the discomfort of those who have been pilgrims and who have believed in the alleged visions. I won't be among those gloating. Most - indeed virtually all - the pilgrims and fans of Medugorge that I have ever met have been good and sincere people whose activities, manner and commitment to the Church have been worthier and humbler than some of those who attack the alleged visions. "When are you next on EWTN?" Want to know more about what it's like working for EWTN/ walking in the footsteps of St John Paul/organising, interviewing, planning such programmes, having odd adventures??? Send a Comment to this Blog (WITH AN EMAIL ADDRESS AT WHICH I CAN CONTACT YOU), and invite me to speak to your parish or school or Catholic organisation...if it's feasible, I'll do it. ...is this Sunday, starts after the 6pm Mass at St Patrick's. Goes through the streets of Soho, with the Blessed Sacrament carried under a canopy, with singing, incense, prayer...finishes at the churchyard of St Giles-in-the-Fields with Benediction. We need a good crowd, so if you are reading this and will be in or near London, come and join in! This is a powerful witness to the Faith in the heart of a vibrant but often sleazy part of London. But it is only really powerful if it has lots of people praying together, so good numbers are needed. ...why Auntie went to Liverpool? ... one of the very best: a good man, a fine priest, a great Australian. Currently being subjected to a vile attack, and deserves our full support. Interested in St Thomas More? Then come and join us on the HISTORY WALK this Sunday (June 7th). Meet 2.30pm at the Church of Our Most Holy Redeemer in Cheyne Row, Chelsea.